You Can Have Endless Hot Water and Never Have to Take Another Cold Shower! Hot water is a precious commodity, especially if you’re the last one to shower in the morning. Plus, with the holidays coming upon us, you may find yourself with a few extra house guests using up all of your hot water. And no one wants to have to take a cold shower before heading out to face the world. Well, good news, your family and house guests can use all the hot water they want and there will still be plenty left for you. How is this possible? Simply trade in your bulky tank water heater for a smaller, better tankless water heater. Traditional tank water heaters keep hot water in a storage tank. Creating a limited supply of hot water. Tankless water heaters, on the other hand, don’t store water at all, so they don’t constantly need to re-heat a large amount of water. Instead, tankless water heaters instantly heat water as you’re using it. Providing you with an endless supply of hot water. Tankless wa ter heaters ability to heat water on demand means if you happen to be fifth in line for the bathroom and someone just ran the dishwasher; you’ll still be able to enjoy a nice hot shower. Another benefit of a tankless water heater is the money you will save on your energy bill each month. Conventional storage tank water heaters need to constantly use energy to heat water around the clock. Tankless water heaters only run when you’re using hot water, which means you can save up to 34% on your energy bill. Plus, tankless water heaters can last up to three times longer than traditional tank heaters. Meaning, you’ll save money down the road when you don’t have to replace your water heater as often as you do now. To have a Plumbing Expert evaluate your hot water needs, simply call us at 1.888.9TIGER4 today or feel free to check us out online at TrustTiger.com. Remodeling your bathroom can be a lot of fun and a great way to improve the value of your home. However, there are a few things you should keep in mind to make the remodeling process a little easier. When remodeling your bathroom, you’ll likely be replacing your electrical outlets and fixtures. But don’t just upgrade your electrical fixtures appearance, you’ll also want to replace and upgrade the wiring. This is especially true if your home is older. Years of high-powered hair dryers, curling irons, hair straighteners, space heaters, electric shavers, radios, etc. have taken their toll on your outdated wiring. So when it comes to remodeling your bathroom, consider having a professional replace and upgrade your electrical wiring as well. Wallpaper may come in a variety of fun patterns and colors, but it simply won’t last long in your bathroom. Even with an exhaust fan, your shower will produce too much humidity to keep your wallpaper in good condition for long. Instead, choose tile or wainscoting for a long lasting solution to your remodeling needs. 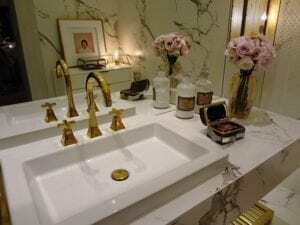 When it comes to picking out a countertop for your bathroom sink, you’ll wan t to choose materials that work for your lifestyle. Natural stone and marble are beautiful, but they also cost more and require more long-term maintenance. Natural material countertops must be sealed several times a year. Plus, limestone and marble will likely become stained if chemicals and toiletries spill and are not cleaned immediately. Laminate counter tops are much easier to maintain and will save you some major bucks on your remodel. When remodeling your bathroom, a new toilet may not be the most exciting decision you’ll make, but it’s certainly an important one! Think about it, where do you spend the most time in the bathroom? That’s why you’ll want to make sure that you spend a little more time when it comes to choosing a new toilet. There are many different options out there, especially when it comes to size, color and features. Then there is the extremely important task of picking the right toilet seat! So weigh this decision carefully and once you do pick the perfect potty, make sure you have a professional install it for you. 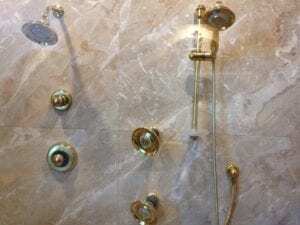 A popular trend in bathroom remodeling is adding extra shower heads in bathing areas. Having warm water hitting you at every angle sounds pretty amazing, doesn’t it? But these multiple shower heads won’t do you much good if your hot water runs out quickly. So, what’s the solution to your hot water problems? The key to more hot water lies within your water heater. If you desire more hot water it might be time to upgrade your water heater. There are a couple options for choosing a new water heater to increase your hot water supply. If you’re a fan of the traditional tank water heater, you can simply upgrade to a larger tank size. The larger the tank size, the more hot water it will store. However, if space and long term cost are a concern, you may consider switching to a tankless option. Tankless water heaters are small and fit right onto your wall so they can be placed almost anywhere. Additionally, they only heat water as you need it so you won’t be paying to heat and store hot water. What’s the best part about tankless water heaters? Unlimited hot water! That’s right, tankless water heaters heat water as you need it. Which means your hot water supply will never run out! Contact us to learn more about how tankless water heaters can keep hot water pouring out of those multiple shower heads! Call 1-888-9TIGER4 or visit TrustTiger.com to have one of our Plumbers and/or an Electricians assist you with all of your bathroom remodeling needs.